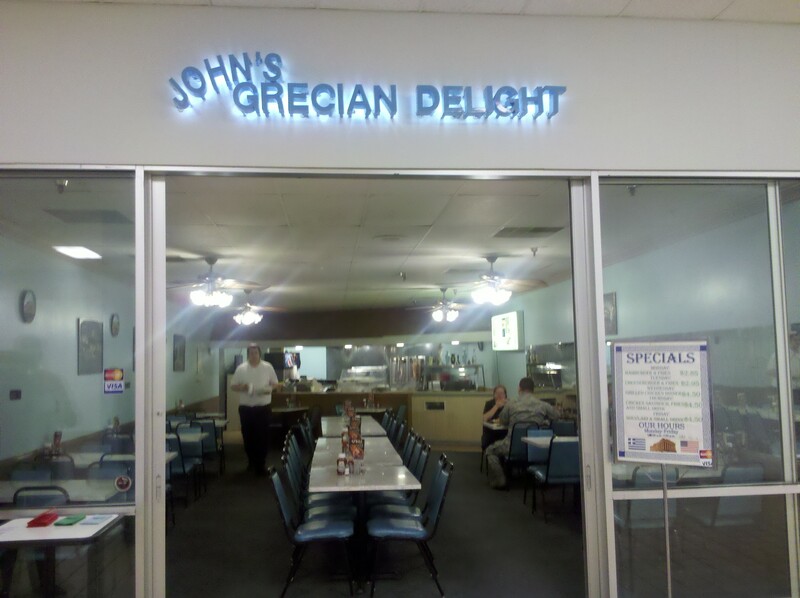 In this episode of Annexed, we take a closer look at one of the mainstays of The Mall: John’s Grecian Delight. Aside from the cafeteria that caters mostly to our office workers, this is the only other eatery in The Mall. The Brit and I have passed by “the Greek place” many times on our bi-weekly walks. We’ve peered in but never stopped. In fact, we’ve never even seen any customers in there. Granted, we usually walk by around 4 or so, which is not a real busy time at any restaurant. Wednesday night I had a 5:30 conference call that would run until 7ish and wanted to get some dinner beforehand or else my stomach would literally be eating me from the inside out when I was done. My options were to hop in the car and drive a few miles to the nearest fast food place (and to be honest, I know less than nothing about what is located in that part of town so I’d probably end up driving aimlessly and get lost and still not find anything to eat and then not only would my stomach be eating me from the inside out but I’d also be late for my meeting) or venture downstairs and brave John’s. I opted for the latter and took The Brit down with me for moral support. We walked in and were immediately greeted by the restaurant’s owner. [Stupid Sarah moment of the week: asking said owner what his name was…I’ll give you a minute…yep, ok, yeah…] He is actually from Greece and still has some of the accent. He was very friendly and chatted with us the whole time he was preparing my chicken gyro plate (complete with french fries and a salad). He actually gave us a nice little history lesson too. John moved his restaurant in to The Mall 29 years ago in 1981. The Mall is about 44 years old. He said at that time and for many years after, The Mall was THE place to be. At one time there were 200 stores there and wall to wall people shopping every day. It was a’hustlin’ and a’bustlin! But then in 1993 The Mall was sold to a different property management company that raised rent. A lot of people left then and many more left over the next few years as a new highway was built running right in front of the mall. But, despite the fact that business has slowed way down, John has such a positive attitude and it was truly a pleasure to meet him. I took my dinner back upstairs and it smelled so good, I literally had people following me back to my desk to see what magical concoction I had in my styrofoam container. The Indians had not been exposed to much greek food so they were particularly curious. A few of the Indians are vegetarian and were concerned there would be no options for them there. Coincidently enough, The Brit is also a vegetarian and had asked John if he had many such offerings. He said that he could make a veggie gyro and of course there were greek salads, spanakopita, and a few other offerings. The Indians were very excited and vowed then and there to have lunch at John’s the next day. Everyone wandered away and I was left to eat my dinner. I’ll admit that I was skeptical. I mean, greek food from a 29-year-old restaurant, situated inside a dying 44-year-old mall does not inspire confidence. But, I gave it a whirl and I was not disappointed. It was yummy! Now, it wasn’t the best greek food I’ve ever had but it was good. I mean come on, greek food is pretty good no matter what. It was however way too much for me to eat in one sitting and I only got through about half of it. Today, I was geared up for the Thanksgiving lunch being offered by the cafeteria when The Brit suggested we go down to the greek place. It didn’t take much to persuade me. Ended up being the right decision as I later overheard some co-workers comment on how much the cafe T-giving lunch sucked. Bullet = dodged. This time I ordered a cheeseburger and fries, to see how well John does with good old-fashioned American food. The Brit got the veggie gyro and Bob had spanakopita and greek potatoes. All were good. I have to admit, John’s fries are THE BOMB! They are the think cut steak fries, cooked to that perfect point where they’re crisp yet not too crisp. Awe.some. Once again, John knew who we were and he talked to me about his grand-daughter who is about the same age as Munchkin. He was such a proud grand-papa. It was so cute. We saw him as soon as we walked in and it really was the icing on the cake. It’s like the Gods of Blogging knew I was going to be writing this post and wanted to give me that extra little gem to include. Thank you Blog Gods, thank you. Extra bonus of the week: the water main burst again!! It really brought the week full circle. I made sure to use the bathroom quickly before they brought in the port-a-potties. Don’t worry, I alert people as to when I’m heading to “see a man about a dog“, given the previous week’s events. If I’m gone too long people start to freak out. Thanks for tuning in! Until next week, consider yourself, Annexed! !